Testers are taught they are responsible for all testing. Some even say “It’s not tested until I run the product myself.” Eric Jacobson believes this old school way of thinking can hurt a tester’s reputation and — even worse — may threaten the team’s success. Learning to recognize opportunities where you may not have to test can eliminate bottlenecks and make you everyone’s favorite tester. Eric shares eight patterns from his personal experiences where not testing was the best approach. Examples include patches for critical production problems that can’t get worse, features that are too technical for the tester, cosmetic bug fixes with substantial test setup, and more. Challenge your natural testing assumptions. Become more comfortable with approaches that don’t require testing. Eliminate waste in your testing process by asking, “Does this need to be tested? By me?” Take back ideas to manage not testing including using lightweight documentation for justification. You may find that not testing may actually be a means to better testing. As quality assurance manager for Turner Broadcasting System’s Audience & Multi-Platform Technologies (AMPT) group, Eric Jacobson manages the test team responsible for Turner’s sales and strategic planning data warehouse and its broadcast traffic system. Eric was previously a test lead at Turner Broadcasting, responsible for testing the traffic system that schedules all commercials and programming on Turner’s ten domestic cable networks, including CNN, TNT, TBS, and Cartoon Network. Prior to joining TBS, he was a tester at Lucent Technologies. Eric joined the tester blogosphere in 2007 and has been blogging about testing on testthisblog.com every week since. When Meetup.com is back up, I’ll link to the page so you can RSVP. For now, plan to join us on the evening of Thursday March 20th. As I recently wrote in Better Software magazine, I tend toward visualizing information. While this does not mean I skimp on words – as anyone who has been near me for 15 minutes can attest – it does mean that I think more clearly when I have a whiteboard in front of me and a chisel tip marker in my hand. “@aclairefication: No sticky notes. No whiteboards. #FiveWordTechHorrors” this happened to me last week. One Christmas gifts my husband installed a wall of whiteboards in our home for the children to draw and scribble. The children loved it and happily covered it with unintelligible childhood graffiti. As it turned out, this blank wall was a greater gift to me. When I was preparing to present at conferences in 2013, I was feeling quite blocked in writing proposals and producing presentation materials until I relaxed and just let myself have time with my home whiteboard. I hadn’t realized how much I missed having a large expanse to fill with thoughts as they came spilling out. At my first testing job, my XP development team installed a wall of whiteboard for just this sort of thing, removing barriers to collaboration by having enough space for any conversation the team needed to have. Of course, some corners were dominated by persistent big visible charts but those lasted only as long as they were needed. Yes, I was spoiled. I decided to keep my presentations simple and sketched the images I wanted to have in my slides on this wall. It turns out taking well lit pictures of whiteboards without glare is sufficiently difficult that there are apps for that. Go figure! I also realized that I would be in a fix at the conference if I didn’t have a whiteboard handy, so I scoured the internet looking for portable options. It just so happened that one of my favorite nerdy websites was advertising a foldable pocket whiteboard. One look and I was in love. I was able to easily take notes in any way I saw fit and at a scale that pleased me, not being limited to eight and a half by eleven or whatever dimensions a digital application considered adequate. In my day-long tutorial preceding CAST 2013, on a team with people I’d never met, I wasn’t sure how to begin solving the problem, but the casualness of a portable whiteboard that could be unfolded, scribbled on, wiped away, and stowed out of the way was definitely an asset to establishing good communication from the beginning. Drawing pictures at work? Really! At Agile2013, in his presentation Sketch you can!, Jeremy Kriegel explained using graphic facilitation to craft meetings that better involve attendees. 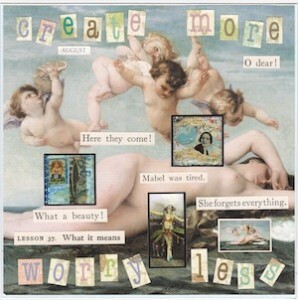 People can focus on visuals easily and suggest improvements. This sketching is a combination of note taking and wire framing, which is something user experience (UX) folks do routinely as part of their work. He describes trading quality of the drawing for speed in order to keep the focus on communication, then enhancing the drawing later. The focus is on the need people are trying to satisfy and understanding the context of that need. By sharing in a concrete way, you can validate precise language and discover where meeting participants are not agreeing. The result is a public record of the conversation that can be shared. (I’ve been known to take many many pictures of whiteboards in my day.) However, the communication is more important than the deliverable, which helped to free me of my concerns about how much artistic talent I have. I felt comfortable improvising and the sketching was a sort of performance, although in the class we were not standing up in front of a group. Earlier today, I was having a conversation with a colleague at a whiteboard and sketching the interacting parts of the problem we are testing was very helpful for focusing the conversation and revealing areas that we needed to investigate. I’m definitely a fan of drawing pictures at work and I appreciate Jeremy’s encouragement. However, I was so drawn to his live sketching videos that I decided to give it a whirl. 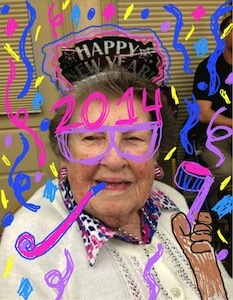 Not sure where to begin, I snagged a photo of my 95-year-old grandmother off a family member’s Facebook and took a shot at digital sketching. I’m pretty pleased with the result. It’s not my best effort and I’m not worried about that because it was so much fun to try. When I’m so busy that I don’t have time to blog or read a book or play a board game, I still have time to sketch something out, however crudely drawn the result might be. I know I won’t turn into an Andrea Zuill overnight, so I keep at it a little at a time. 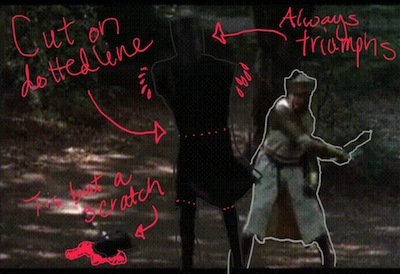 I’m finding that sketching on digital photos or enhancing existing images (so far no original memes!) is much much easier than starting from nothing, so that’s kind of my thing at the moment, but I’m finding the courage to stretch a bit more into original composition. We’ll see if anything comes of it. For now, it gives me something creative to do that personalizes my slides a bit more. How do you use sketching for fun or profit? I heard that Gerry Weinberg has an exercise called “Mary had a little lamb,” in which you analyze each word in the sentence to elicit implicit meaning that might be important. This sounded interesting enough to try, so when the opportunity came to propose a topic at Test Retreat 2013 I went for it. My topic “Is testing for me?” didn’t end up formally scheduled but made a nice interstitial topic to discuss with those milling about in the main room. I chopped the sentence into separate words and wrote them top-to-bottom on a large sticky note. Then, instead of giving some sort of prepared remarks, I elicited brainstorming from the gathered participants. 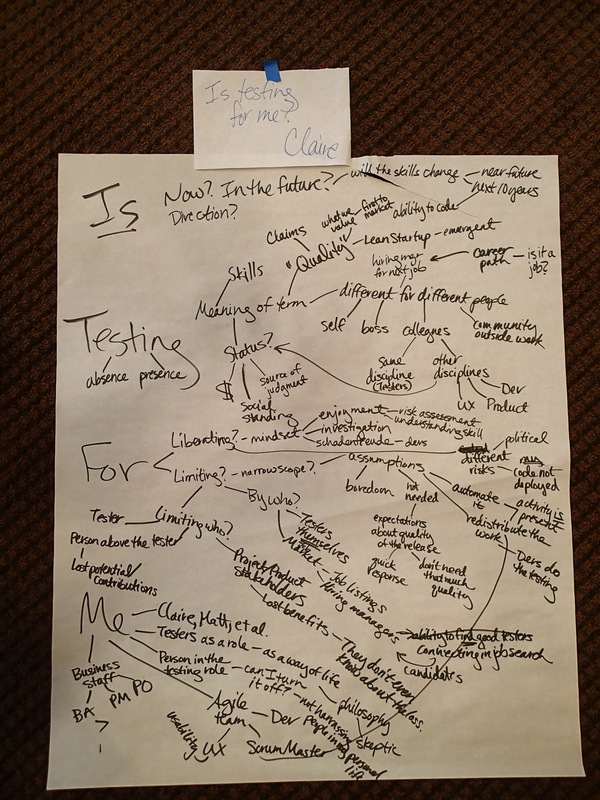 Having received interesting feedback on my professional and personal strengths at Agile2013 that had left me questioning how best to use my evil powers for good, I wanted to hear how others were thinking about the testing field and how it fit them. The resulting scrawled notes ended up a mindmap, the path of least resistance for me. I won’t say the discussion solved all my problems, but it did give me some direction for future exploration – exploration that might also be helpful to a newbie wondering whether to pursue a career in testing. I started composing a list of things I’d recommend to people just starting out as testers to help them to evaluate whether to continue. I wanted to encourage them to jump right in but also think big, not waiting them to wait 5 years to reach out to the wider world of testing (like I did). Here’s my current list. I blogged about various experiments I tried, so you can read for yourself to see what it’s like to select what’s a good starting point for you. Books, Podcasts, Blogs, maybe even writing for some ezines or websites? uTest/Applause? I’ve heard of this but not tried it. Seems like a lower barrier to entry/way to get started? And, last but not least, who do you want to be? No matter how many times I think I’ve found all the meaning in my testing career, suddenly I realize there are more layers… but like a parfait, not an onion. Donkey: You know what ELSE everybody likes? Parfaits! Have you ever met a person, you say, “Let’s get some parfait,” they say, “Hell no, I don’t like no parfait”? Parfaits are delicious! Thanks for the inspiration to write, EmJayKay80 and Niyi! Over the last few years, I have been getting to know other software testers here in Atlanta. Frequently, beginning this new acquaintance is such a positive experience that the other tester urges finding others similar to us to meet more regularly. This is such a common outcome that I am no longer surprised when first conversations end this way. I don’t have much experience with the particulars of sifting through a large tech community for people interested in hanging out during their personal time to chat about testing software. However, when others insist on giving you a boost, it’s harder to say no. I have demurred all these requests until now. Eventually it seemed silly to continue to turn down the genuine offers of resources, energy, and enthusiasm. I almost felt bad about denying people the community they so clearly craved. So here we are. I love meeting new people and engaging them in conversations. However, I realize not everyone is comfortable doing that. I’ve noticed that having a structure to interactions can reduce the social barriers for those who might otherwise hang back. At Agile2013, I noticed that Lean Coffee was an easy way to get to know a group of strangers, so I thought it would be a good place to start for the newly formed Software Test Club Atlanta. 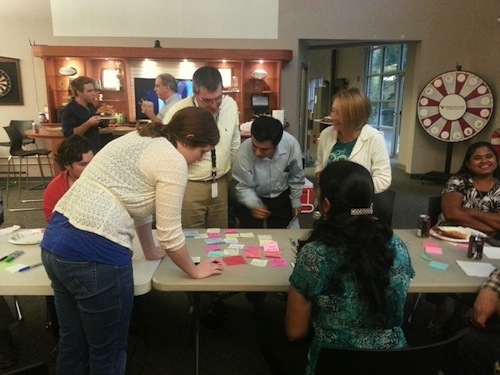 I have participated in several Lean Coffee events run by different facilitators. I liked the simple style and frequent feedback so much that it was the first thing I brought back with me to work after Agile2013. The format proved fruitful for an internal meeting and so it seemed like a good idea for starting this local meetup. Another good idea for starting something new is affiliating with established allies. Since one of my benefactors was part of the Software Testing Club community, I thought co-branding made a lot of sense. I led the idea of extending their brand to the United States since doing so would bring more people together worldwide than I could on my own. I wanted our nascent local group to be connected to the larger world of testing enthusiasts from the beginning. That would support the new members’ sense that each of them is not alone, the connection that drove creating this group in the first place. This is really a community building itself. I just happen to be in the center of it. I love helping people to connect deeply with one another, so it seems only natural to put in the effort of providing the means for others to come together. Now that I work in social media, setting up channels for others to find us and join in the discussion was my first step. I want to be discoverable so that other local testers who feel the need for connection won’t have to wait so long for me to happen along. I really appreciate that local businesses are supporting our efforts to make time to tackle difficult questions in testing and to share what we’ve learned through our professional and personal experiences. So you will definitely hear me being vocal about thanking them. I wouldn’t choose to do this alone and I’m encouraged that others think this is a cause worth the investment. I’m confident that we’re building a strong community of thoughtful and curious folks who give each other’s ideas a chance. At our first meeting, I facilitated the Lean Coffee format since I didn’t want anyone to feel put on the spot to take over something they hadn’t experienced. Since we had 15 other in-person attendees and 3 online folks, this was a much larger group than normal. Although I recognized that groups of this size would normally split, I thought keeping everyone together would be better for cohesiveness. We did use a simple personal kanban board. Each person had a chance to contribute topics. Due to the size of the group, each person had 3 dots to vote on which topics had priority. We established a 5 minute interval between votes to continue. Then, I added a “mercy kill” rule that after 10 minutes we had to move on to the next topic. I wanted everyone to experience the variety of Lean Coffee and knew that our topics were so complex that they could easily take over the entire time we had to meet. Those topics we still wanted to pursue went into our future meeting backlog. As a result, we covered all of the topics that had received a vote. When items in the To Do column had an equal number of votes, I picked one to be the next to proceed to the In Progress column. Any topics we had covered sufficiently went into our Done column. While this execution wasn’t a strict interpretation of Lean Coffee, it was a perfect adaptation to our purposes. The conversations continued after we had officially ended and people are looking forward to getting together again next month. We had lots of leftover pizza and beer, possibly because we were too engaged in the interaction to step away to enjoy the refreshments. All in all, it was a great investment of my time and I look forward to doing this again and again. (1st) Who should “own” test automation? dev/test? (5th) Testing in Kanban – its own column? encourages handoffs? (9th) Test/programmer pairing – success stories? Does it work? What do you use to test multiple browsers? What avenues do people use to find out about testing methods/tools? Whole team testing – good idea? How to get it working?